Social Security is nothing but a mechanism adopted by the government system to provide monetary assistance and benefits to the needy. People with inadequate or no income are at the focus of this scheme so that they can lead a dignified life. The OASDI (Old Age, Survivors and Disability Insurance) program is what is known as the Social Security system in the United States. 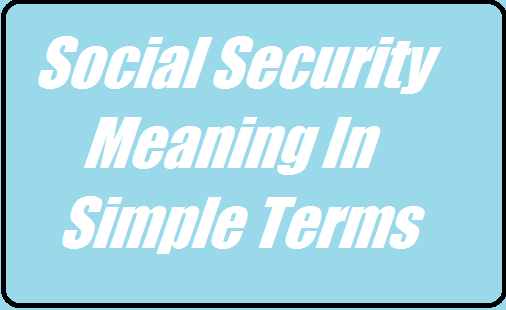 Social security came into existence in 1935 under the leadership of President Franklin Roosevelt and at present includes numerous social security and social insurance programs. The main spheres of life that Social security aims to help in include old age, poverty, unemployment, various kind of physical and mental disabilities and difficulties faced by a widow(er)s with or without children. Social Security is administered by the United States Social Security Administration (SSA) which is an independent agency of the US government. The funding for Social Security comes through the payroll taxes which are referred to as FICA (Federal Insurance Contributions Act) tax or SECA (Self Employed Contributions Act) tax. The two Social Security trust funds are the Federal Disability Insurance Trust Fund and the Federal Old-Age and Survivors Insurance Trust Fund and it is the IRS (Internal Revenue Service) that collects the tax deposits. All salaried income up to a level specified by the authorities is eligible for Social Security Payroll Tax and the income above that level is exempted from tax. At present this limit is set at $128400. Almost all the resident of the United States own a Social Security Number because of its wide requirement in nearly all kinds of businesses. The poverty rate amongst the Americans aged 65 and above is said to be reduced to 105 from the earlier 40% owing to the funds collected from the Social Security Scheme. This explains the usefulness and the popularity of this scheme. The benefits of the pension program are funded by a 12.4% tax split between both the employee and the employer. Social Security, on the whole, is based on a regressive tax policy as the income keeps on increasing while the tax goes on decreasing. For claiming Social Security benefits you should be between 62 and 70 years of age. A person should be insured to qualify for the Social Security benefits. Most of the above-mentioned benefits require a status of complete insurance that is obtained by gathering a number of credits from earnings of the covered employee. These credits are also referred to as quarters of coverage. The number of credits you need depends on your age and the type of benefit you wish to avail. The credits that can be acquired by workers also depends on their annual earnings and these earnings are updated regularly based on annual wages. There are numerous benefits that are offered by this Social Security scheme of the US government. All these benefits are mentioned below in detail to help you know more and in depth about them. Read on to get a better picture of this social welfare scheme. The workers who have been covered under the scheme for a sufficient number of years are eligible for the retirement benefits of Social Security at the age of 62, disability or death whatever comes first. If a worker has as many credits as the years between 21 years of age and 62 years of age then he is fully insured for retirement benefits. A worker who attained 21 years of age before 1951, one credit is required each year from 1950 until he attains 62 years of age, disability or death whatever comes first. Workers attaining age 62 after 199o need 40 credits to claim retirement benefits. For workers who die before attaining fully insured status certain survivor benefits are also available. If the person delays claiming the retirement benefits until he reaches full retirement age then there is an additional benefit offered to him depending on his year of birth. Women tend to live longer than men which is why they benefit more from this scheme as it makes use of the average survival rate for calculating benefits. After the age of 70, there is no more increase in retirement benefits offered by the Social Security. If a worker covered under the Social Security retirement system dies his or her spouse is eligible to claim the survivors' benefits. At times these benefits extend even to the divorced spouses. The least age to claim such benefits by a nondisabled widow(er) is 60. For spouses older than the normal retirement age the benefits are the same as the worker's Basic retirement value. If the benefits are started before the retirement age there are certain reductions made. Children of a retired or disabled worker receive benefits under the Social Security system if they are under the age of 18 or if they are still attending primary or secondary school or are over 18 years of age and became disabled before 22 years of age. This ensures that the kids of the deceased still have the chance to make their career and a living for themselves in the future. Social security benefits are not just confined to retirement benefits but also for individuals who have been working but because of unforeseen conditions cannot continue to work because of disabilities. The disability benefits under Social Security can be availed after five calendar months of the disability irrespective of the age. The eligibility criteria requires few credits earned overall and certain credits earned within 10 years immediately before the disability. The disability should be long term that could result in death and the worker should be unable to work anywhere after the disability to claim the benefits. Social security is the United State's largest insurance scheme that provides retirement, survivor's and disability benefits to the needy to help them lead a dignified life.